This recipe is a culinary stroke of genius and I’m going to enter it into every recipe contest I can find. This “recipe” is what happens when I go to cook hot dogs for a weeknight supper and realize the buns have gone missing. These are stupid easy and your kids will think you’re a rock star for making them. We eat hot dogs all. the. time. because they’re quick and easy and this is just a fun way to change things up a bit. These heat up really well the next day so I’m thinking about making a double batch next time and having a stock of them in the fridge for meals on the go. They’re delicious! In the best sort of cheap cheese, processed meat, canned dough way. I mean, come on, sometimes a little American junk food is good for the soul. Preheat oven to 350 degrees. Heat hot dogs in oven while it is preheating (but not longer than 15 minutes or they may burst). Unroll crescents and place cheese slice half on wide end of dough. 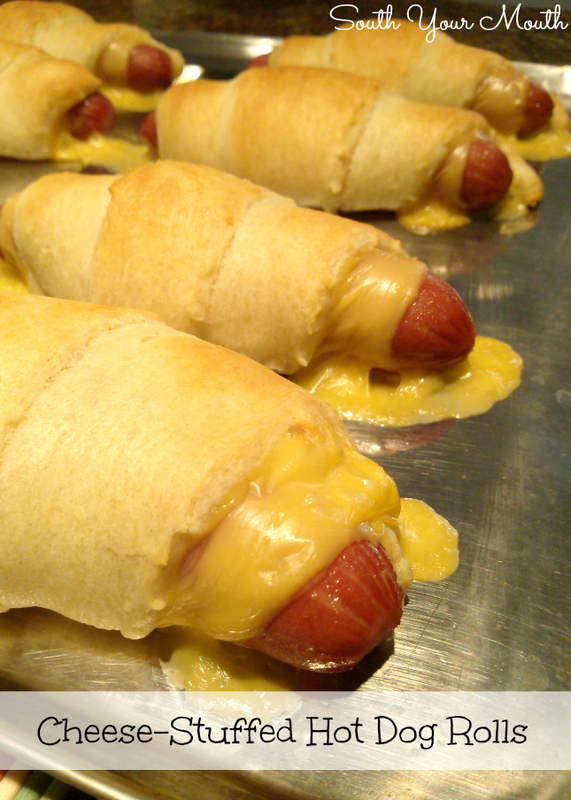 Place a hot dog on the cheese and roll dough to shape a crescent around the hot dog. Bake on a baking sheet lightly sprayed with cooking spray for 12-15 minutes or until dough is golden brown. Cool 5 minutes on pan then serve. Once the cheese cools a bit, it will lift right off the pan with the hot dog rolls. I always use the “deluxe” American cheese slices instead of the individually wrapped slices. The flavor and texture is SO much better. And, I might as well go on the record and tell you how much I love Oscar Meyer hot dogs. Just the plain ol’ “wieners” not the all-beef, not the low fat, just plain ol’ Oscar Meyer hot dog wieners. I still make these and my kids are grown and gone now. Fun and easy. I think I'll try them with the new jalapeno hot dogs I bought last week. With your macaroni salad will be an easy meal on a hot night. This is my favorite food in the world! Everyone I know calls them "pig-in-a-blankets"! Because it's not high enough in fat, I'm probably going to wrap the dog in a slice of bacon, too! My mom used to make these for me when I was a kid in Vermont. But being a good Vermonter, she used wicked sharp cheddar cheese!